I had a chocolate craving over the weekend. So, I decided to bake a Chocolate Soufflé Cake from my latest cookbook addition, BAKING, by James Peterson. All the recipes seems doable and includes step-by-step picture guides for even the novice baker, like me, to succeed. I will attempt to bake more going forward using the recipes from this cookbook. Obviously, I will share my thoughts about the book with you as well, my valued readers! 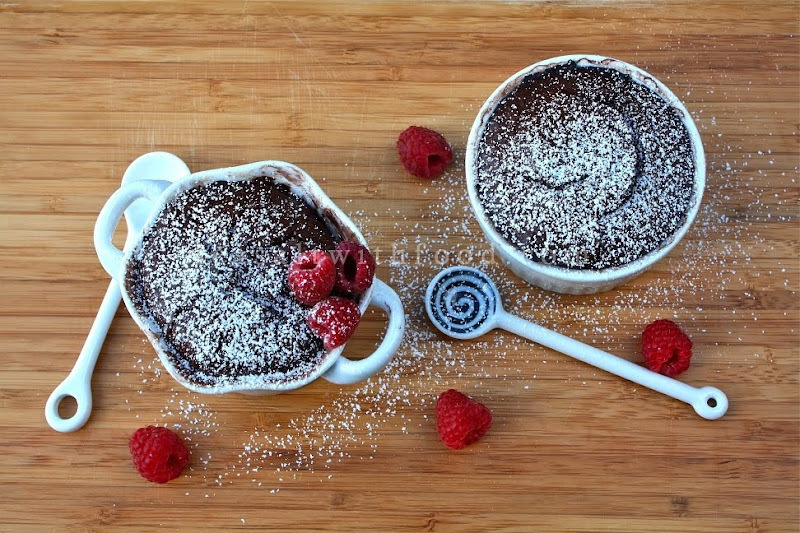 Brush six 5- or 6-ounce ramekins with butter and coat with cocoa powder. Combine the butter and chocolate in a heatproof bowl set over a saucepan of simmering water. Stir with a whisk or silicone spatula until smooth and melted. Remove from the heat. Beat the eggs and sugar on high speed with a stand mixer for about 5 minutes or until the ribbon stage: when the beater is lifted, the mixture falls in a wide band onto the surface, forming a figure of eight that stays for 5 seconds before dissolving. Pour the egg mixture over the chocolate mixture and fold with a rubber spatula while sifting the flour over the mixture. Alternate between adding flour-about one-fourth at a time-and folding until the flour is no longer visible. Transfer the mixture to the prepared ramekins and smooth the tops. Cover with plastic wrap and freeze for at least 2 hours. Preheat the oven to 425˚F. 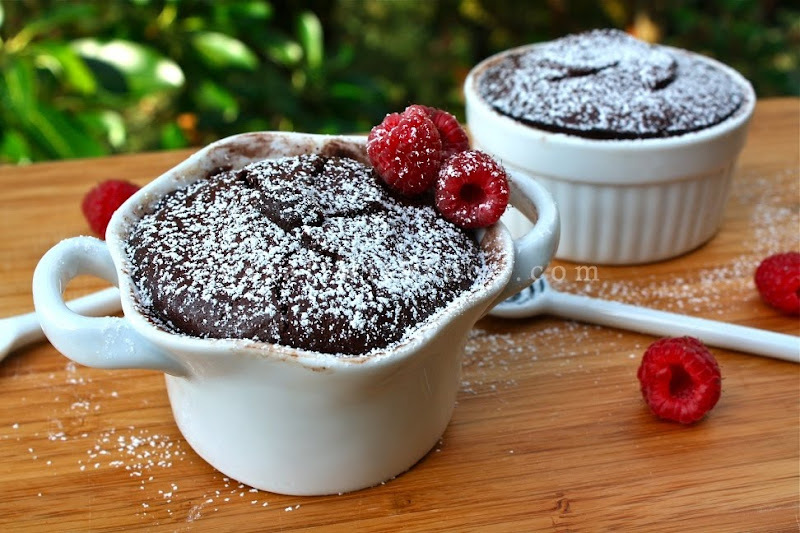 Bake the souffle cakes for 17 to 20 minutes, until risen almost by half. Sprinkle with confectioners' sugar and serve. If you want to unmold the souffle cakes, run a knife around the inside edge of the ramekins. Turn the souffle cakes over onto plates, lift off the ramekins, and sprinkle with confectioners' sugar. Serve warm. Gorgeous little cakes! I look forward to hearing more about this cookbook! 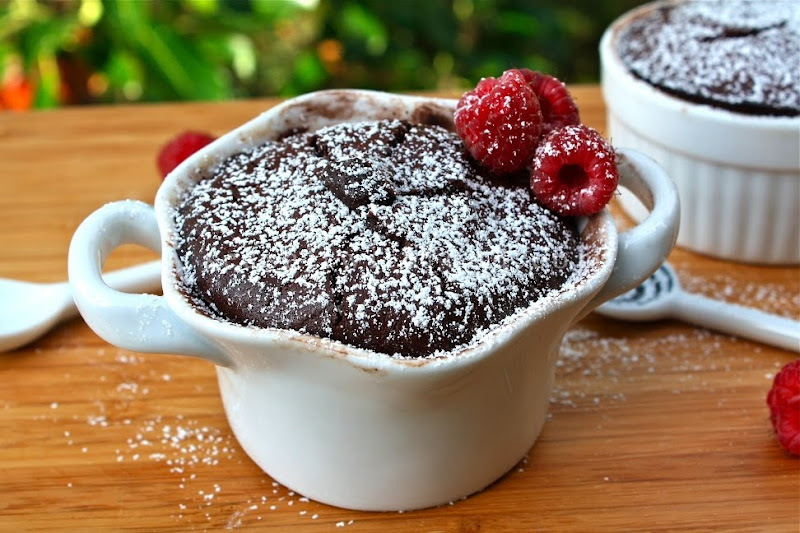 I'm curious--what's the difference, then, between "lava cakes" and souffle cakes? Because at a glance, they look the same and have similar proportions in their recipes, with the sole difference appearing to be baking times? Do these not gush chocolatey goodness? They do look positively scrumptious, I must confess! Looks yummy - might make this this weekend! Just to clarify... 2hrs in freezer to set & then directly into a 425F oven? Ramekins did not break? Or did you allow it to sit out at rm temp before popping into the oven? wow...these look delicious! They look intimidating to make but I might give them a try! btw, these would be perfect for my sweet celebration contest I'd be glad if you could send them in for my blog event! Beautiful pics, and love that you paired these with the raspberries - perfect combo with the chocolate!